Towards the end of the 17th century, Cheikh Nemr son of Cheikh Abi Nassif Nawfal el Khazen from Ajaltoun, founded an establishment in Ballouneh aimed at helping out family members in distress and he allocated a lot of money and lands for this sake. Later on, he founded a monastery and built a church in honor of Saint Elias The Living all within his properties, and joined monks and nuns to serve the monastery and the Lord. In the first half of the 18th century, Cheikh Elias son of Cheikh Nemr made few changes to the monastery and built a shrine for himself. However, he was not rested in it but instead in the family graves at Our Lady of Delivrance in Ajaltoun for social and political considerations. The years that followed saw the monastery grow in importance and became a Diocesan Chair during the 19th century. 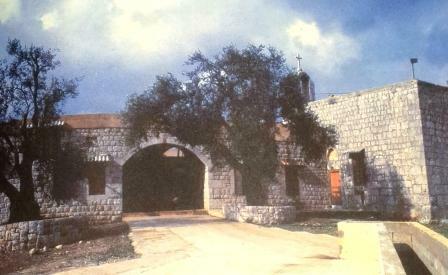 Back in the 18th century, the Lebanese congregation (المجمع اللبناني) had no specific rules when it comes allocating a residence for Bishops within their geographical domain. This led bishops to make monasteries their permanent residence, regardless of whether the monastery was located within their diocese or outside it. The situation remained the same for years up until the Lebanese Congregration (المجمع اللبناني) met again. In the early 18th century, the ecclesiastic and spiritual mission of the Monastery of Saint Elias The Living evolved considerably. When Bishop Ignatius Chrabieh (1732-1747) took over the Tyr Diocese, he chose as residences the Saint Elias Monastery and Our Lady of Louaize monastery in Zouk Mosbeh and he used to move between them all the time. He ended up passing away in Our Lady of Louaize Monastery where he was buried. Later on, in the late years of the 18th century, Bishop Abdallah Nasteer Al Traboulsi (1762-1768) was handed over matters related to Keserwan villages by Patriarch Toubia el Khazen, and was given the Mar Elias' Diocesan Chair, where he died later on and was presumably buried there.